Our Super Single series make an ideal choice as a replacement to the original equipment clutch/flywheel and provide your vehicle with unparallel response and race performance. The Supersingle clutch design is a product of our cumulative knowledge and experience in developing and refining our Racing Multiplate Clutch line. 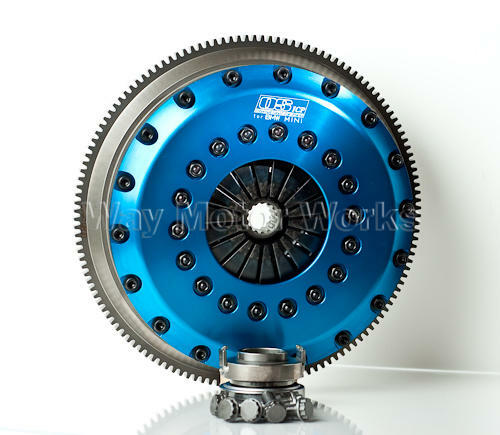 The STR series single plate clutches were designed for daily driven high performance vehicles. STR clutches provide the comfort of the stock clutch’s pedal feel and the strength of a race ready setup. Whether it be a lap around the track or a trip to the corner store, the STR clutch equally handles each task with ease. OS Giken Clutches: Through our research and development of high performance engines, we realized the need for the production of higher quality, more durable clutch systems to meet the rigorous demands of race and sport driving. Our OS clutch is able to transmit engine revolutions and output to the drive train without loss. They are made of the highest quality materials and their durability is second to none. Our continual research and development has brought about many improvements and we are confident that our clutches can meet the demands of even the most heavily modified vehicles. What is the difference between an OS Giken clutch and another companies clutch? Through years of development and since its first introduction to the public in 1983, OS Giken clutches have always focused on extraordinary durability, drivability, and effective power transmission. In order to properly develop a clutch system to maximize drivetrain performance, OS Giken determined that it would be most effective to engineer and manufacture clutch kits as a clutch/flywheel package. By doing so, a clutch kit can be installed which has already been properly matched to your MINI. Additionally, the design, engineering and manufacturing of OS Giken clutch kits promote improved durability (through friction plate material which is carefully selected and alloyed so that the plates match with the materials of the flywheel and center plate), maintained drivability (through revised leverage mechanisms to provide higher disk pressure while reducing pedal effort), increased longevity (through a superior design and usage of extra manufacturing processes for strengthening). Kit includes Clutch Disc, Pressure Plate, Flywheel, and a metal Throwout Bearing.